I would like to copy the sumbissions from a jotform generated google sheet but I am experiencing issues. I want to use the copy of the sheet to manage and assign the requests. The copied sheet does not auto copy the new submissions using the importrange function. To get it to update I have to manaually edit the function. Just to make sure this was an isolated issue I checked to see if importrange worked using two other spreadsheets and it worked fine. Does jotform prevent the copying of jotform generated sheets? Is there a work around to this issue? I also could not import the Excel submission list into a Google Spreadsheet. 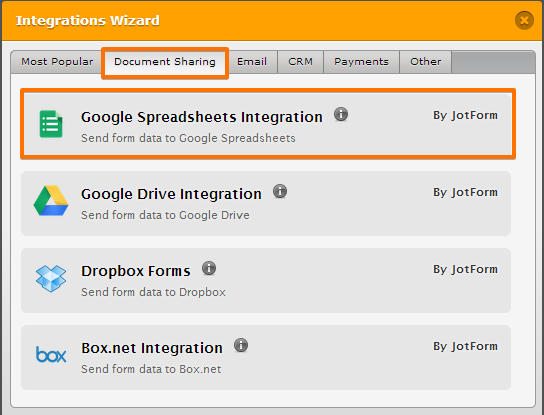 I believe the best way is to create a Google Spreadsheet Integration in your form and then merging both spreadsheets. updating automatically when new form entries are received. spreadsheet_key - The long sequence of characters in the "key=" attribute of the URL. In the new Google Sheets, use the entire URL. You can read more about importrange function HERE.